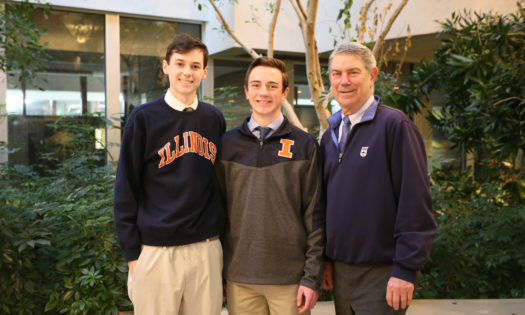 Two Saint Patrick High School seniors have received full tuition and housing college scholarships through the Western Golf Association’s Chick Evans Caddie Scholarship to attend University of Illinois at Urbana-Champaign in the fall. The scholarships – renewable for up to four years – are awarded to high school seniors who have a strong caddie record, excellent grades, outstanding character and demonstrated financial need. The Saint Patrick seniors who received Evans Scholarships this year are Malachy Byrne and Declan Gillespie. With the addition of these two Shamrocks to the Evans family, Saint Patrick has now had 106 students earn the prestigious scholarship. The school leads the nation in Evans Scholars, with 16 graduates currently receiving a tuition-free education. Saint Patrick President Dr. Joseph G. Schmidt, AFSC – a past Western Golf Association (WGA) board member – is extremely proud of the efforts he’s seen from St. Pat’s students over the years, and strongly believes that caddying can help young men set themselves up for success later in life. Both Evans Scholars are grateful for the opportunity the scholarship provides them and their families – and to St. Pat’s for paving the way to their future.